SEMA is the big dog in the automotive aftermarket world, where manufacturers, customization shops, and the entertainment industries all converge for 4 days of showmanship and business. 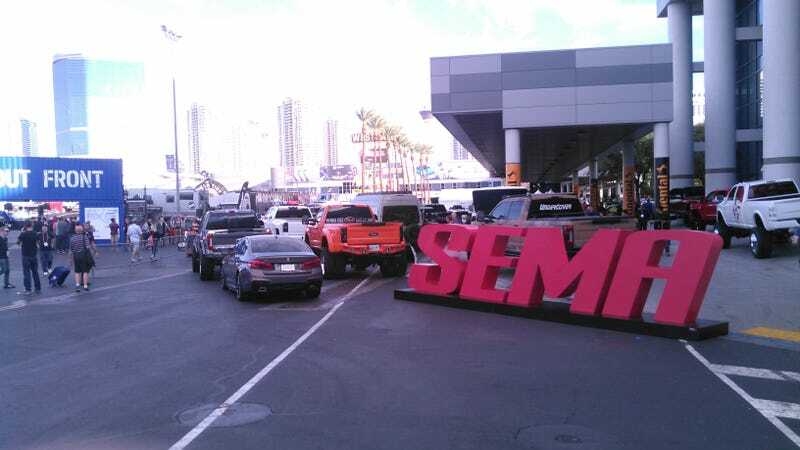 This is my third year going, and every year it seems that SEMA continues to grow and expand all the while hanging on to the past. But with the growing comes the pains. One of the security checkpoints between the Central Hall and the South Hall Connector. It was only one month before when Stephen Paddock opened fire on the Las Vegas Village’s hosting of the Route 91 Harvest Festival from a 32nd story perch at the Mandalay Bay Hotel, killing 58 people before he committed suicide. SEMA, being an international and high profile convention, would’ve been a tempting target to persons with ill intent. In a surprise move that many attendees probably weren’t warned beforehand a/or didn’t expect (the author included), attendees were funneled into several distinct security checkpoints, and many of the exterior LVCC doors to the halls were slapped with EXIT ONLY signs and manned by security staff telling people to go thru the checkpoints if they tried to circumvent. The line going into South Hall snaking around the food court, with a security guard watching the exit to her left. The “security theater” did have it’s flaws: Everyone got crowded into long lines, depending on the time. It would take between 5-15 minutes to get into some halls. If you had a bag of some sort, it was checked. Once checked, you were allowed in. If you didn’t have a bag, then you got sent thru the metal detector and then allowed in. Lines wrapped around buildings and displays. I even saw open doors to the halls in a few cases not manned by Security (one was right behind the Toyota Booth, to the lackluster retrospective of the Camry lineup history). And the venue would’ve benefited from one more checkpoint, at the North Hall entrace by Paradise Road, to help in crowd control and relief. With that specter hanging, SEMA did show it’s stuff despite the threat. Halls packed with every imaginable thing, from fantasy cars to mundane tools to booth babes to the masses of industry people looking for the next best thing or to shop for items to augment their own businesses. This year for me was to collect literature for a business idea I have; without going into specifics, it concerns car breaking/salvage. The big problem for me in a venue full of excess was many. From finding what tools I need to seeing if some bank or lending institution is smart enough to offer easy Business Loans at a show that is a multi-million dollar industry onto itself (spoiler: nope). SEMA is like a big candy store, it claims to have “everything,” but it doesn’t stock the specialty candy from Japan made from the “sweet nectar” of neko catgirls. Silver Lot #1 with the Ford Out Front skid pad. Even though it’s an Industry-Closed Show (you need to be a member of SEMA or have ties to a business that is registered with SEMA), SEMA does still offer a ton of juicy eye candy to the public mostly in the Silver Lots outside in front of the Main halls and a few side areas, plus SEMA Ignited and the Car Parade on Friday Evening. Everything from Hot Rods to Bro trucks to Supercars to even Camper Vans can be seen outside that will sate nearly every people’s wishes and wants. Ford Motor Company was out in front of Center Hall in Silver Lot 1 thrashing it’s products and those of partnered shops in it’s massive skid pad. The first morning I saw a DRAGG Mustang blaring it’s lights and sirens as it made tire smoke. Three Ford Raptors ready to be hooned. On the other side in front of South Hall, you had the trucks, mostly of the Bro-Truck Variety, Offroading, and the wheel companies. These are usually packed, seeing that well.....Trucks and Wheels!! This was taken on Friday Morning, when everyone is still asleep drunk a/or was fucked silly by some Transgender Prostitute the night before. One of the alleyways for customized wheels. Of course, the goodies are in the Halls. Four Halls from New Cars to Screwdrivers and Ball Peen Hammers. Count the Skybridge, Westgate, and the Performance Pavilion, and thats a metric shitton of stuff packed into one of the worlds biggest convention centers. South Hall Lower Tire Area, back side. Mostly the little and lessor/foreign brands. Try and spot the Indian Tire Brand in the photo! South Hall Lower Tire Area, looking towards the front. The big name tire/wheel exhibitors and others. FCA/Mopar booth is to the left. South Hall Upper. Mostly the Truck and Off Road stuff. The Truck Hero booth (on a white carpet) took up most of the space up here. View of the FCA/Mopar booth. One of two (?) Willy’s Jeeps at the show. Now i’m gonna focus on a depressing sight at SEMA 2017. Toyota in it’s infinite wisdom decided to bring 15 Camrys, from stock models in a retrospective of it’s model line outside to a whole flock of them modified by it’s NASCAR drivers who campaign the Toyota marquee......and Rutledge Wood. I have to wonder as a Toyota fanboy: WHY? Why not bring in a Supra test mule, some cool offroad Tacoma trucks, or even the Yaris to target the youth market? And why did you give that hack of an “Analyst” a car to modify? Toyota Booth in the back of Central Hall. Nothing but Camrys!! Tomorrow I highlight my run-in with the Roadkill boys, what I did away from SEMA, how I navigated Las Vegas during SEMA, and my surprise lodgings.